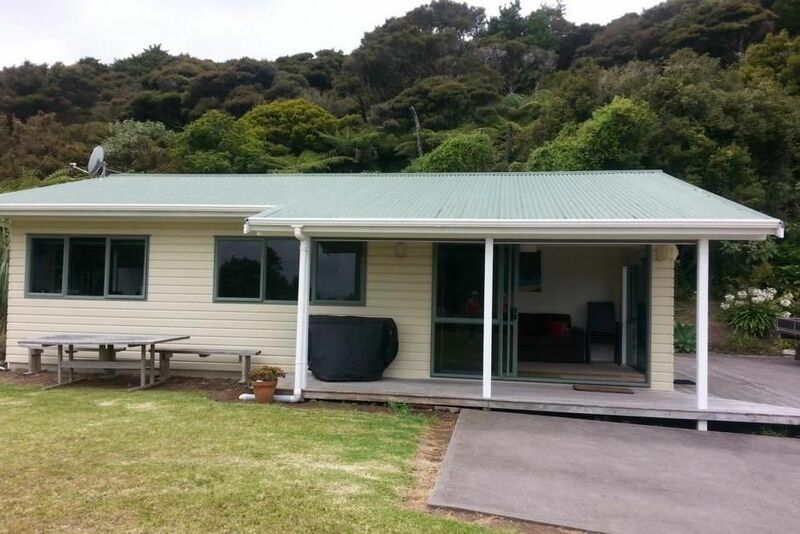 Situated just 21km from Whangarei CBD, this tidy 2 bedroom abode awaits your arrival. Plenty of room to park the boat, and large lawn for children to play safely. Not Wheelchair friendly. McLeod's Bay has safe swimming, is great for all water pursuits, boats can be launched from the beach. Whangarei Harbour is renowned for fishing and diving with Whangarei Heads having beautiful East Coast beaches, and is the gateway to off shore Islands. There is a store and cafe/ takeaway within the bay. A tennis court and numerous walkways and tracks for all fitness levels within short distance. A Service Station is at Parua Bay, (only 8 km away) for fuel, dive and propane, a Four Square, liquor and bakery stores at the shopping center. The Pines Golf course 12 km towards Whangarei. There are 2 bedrooms, 1 Super-king bed, 2 single beds, a fold down double bed, and 2 spare mattresses. This is the ideal time out for you, your family and friends. Do not delay, inquire today! 50% deposit on confirmation, balance to be payed 7 days before stay. NOTE: Under Kiwi bach tradition you are expected to: Clean and leave the house as you find it. Leave the Washing in basket provided. Retired couple who have lived in Whangarei their entire married life. This was a family bach, which was demolished and todays bach was built in 2000. Private, comfortable, easy indoor / outdoor flow. It's all there for a great holiday!! Up a right-of way so private with a safe playing area for children due to very little traffic movement. Plenty of space for you to bring a boat. Only 100m to safe swimming beach and boat launching. Children's play ground next to the beach. Lovely peaceful view overlooking the harbour. You will hear lots of bird life. Very picturesque walking tracks close by, Mt Mania and Mt Aubrey are in Mcleods bay. Only a few kms to Ocean Beach which is a surf beach. Ocean Beach further on the Whangarei heads road, and easily accessible. Village at Parua Bay, and small shopping center,with all amenities including Petrol station, and abilities to fill Dive bottles. Mt Mania and Mt Aubrey very close and Overlooking McLeod Bay. Heater for the cooler weather. Supply sheets, Bedding, Dish clothes, Tea towels. and bath towels. Washing machine, Outside line and wrack.and Pegs. Good parking on concrete, and plenty of room for a boat on the large lawn in front of Bach. Good play area for the children. Guests to provide own swimming towels.Others provided. supply coffee, tea, sugar, Salt and pepper. All crockery, utensils for 6 -8. toaster,Toasted sandwich maker. Oven dishes. Full kitchen, all utensils and crockery supplied. large lawn,with lovely sea view. safe for children and/or parking the boat.Concrete drive and parking area. BBQ table.and outside chairs. covered deck , and out door chairs and table. There is a popular child's play ground down the drive and over the road next to the beach. Great walking tracks Cafe within walking distance. Restaurant and Bar at Parua Bay Hotel. Quiet and private. The young kids loved the Pukekos on the front lawn and the goats over the fence. The house had everything we needed for a comfortable stay. Clean and tidy and fantastic views. Pleased you all had a great stay.Thank the children for the lovely paintings. Thankyou for leaving everything so clean and tidy.You are welcome back anytime. Great dealing with you. Cute, cosy cottage with fabulous view of the bay. Very clean. Just lovely. Delightful stay in this lovely modern cottage overlooking this stunning bay. Wonderful to walk down the drive to a perfect swimming spot. Not far from Parua Bay cafe and pub. We loved it and will definitely be back. Thank you! Thank you for leaving the Bach so clean and tidy.Great communication with quick response. Would be welcome back any time. Excellent location, lovely peace and quiet it was hard to drag ourselves away. The views were amazing and the holiday house very comfortable - especially the powerful shower and outdoor seating area. Would stay again as highly recommended. Lovely and peaceful, very clean and tidy, great views, very well equiped with all you may need. An amazing property! Very cosy, tucked in the bush, away from the hustle of the main road and yet within very short walking distance to beaches, shops and walks. Great views towards Mt. Aubrey and the bay, nice outdoor area (make sure you try the badminton set on a good day), with resident pukeko and quail families foraging freely on the front lawn and around the house. The house is very clean and tidy, with spacious rooms with comfy beds, kitchen well equiped with all you may need during your stay. Porch facing west (equiped with blinds should you wish to keep the sun or rain away!) so great for enjoying a book and a cup of tea, looking at the sunset. The hosts are amazing - Tuppy is an absolute pleasure to deal with! Very accommodating, flexible with check in and checkout times and always ready to help and make your stay more enjoyable. Thanks Tuppy and Don for the opportunity to spend another unforgettable holiday at this lovely spot! We love this house! Thankyou very much for leaving the Bach so clean and tidy. You were a pleasure to deal with, and to have to stay. Great communication, and you certainly would be very welcome to return. Private, tidy and peaceful retreat for a long weekend. Excellent Walking tracks, Mount Mania, and Mt Aubrey to climb. Surf at Ocean Beach. Grocery, wine shop, Hot bread shop at Parua Bay. Cafe within walking distance from Bach, The DECK. Safe swimming, Bach up right of way and safe playing area for children, and for parking boats.